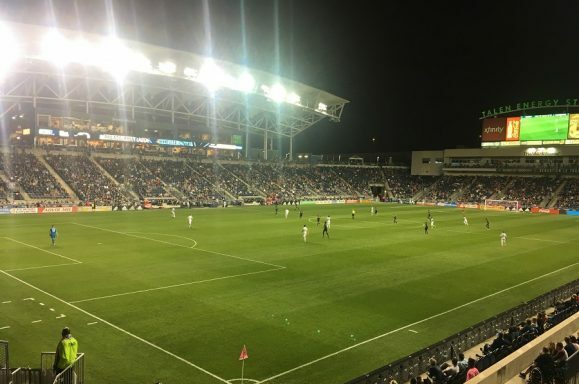 On the road, against a Philadelphia Union team on the upswing, the Loons were never going to be favorites. But even a sober observer probably didn’t anticipate the team’s complete and total capitulation. Minnesota was down 0-4 at half, and after a switch back to the 3-5-2 and a more relaxed approach from the hosts, the game mercifully ended 1-5. But if the result on the field was a black eye, what transpired on the sideline was arguably even less acceptable. All but eliminated from the playoffs, Head Coach Adrian Heath stuck his head in the sand and left the team’s two top draft picks, both of whom could otherwise have been on loan in the USL, on the bench. Yet again, it’s time to ask; what are the Loons building? Minnesota have played significant minutes this season in a 4-2-3-1, a 3-5-2, and a 4-4-2. They’ve played with a partnership of Ibson and Rasmus Schüller in midfield, a troika of Ibson, Schüller, and Collen Warner, and most recently a pairing of Maximiano and Fernando Bob. They’ve started the season with Francisco Calvo as the unquestioned starter at left centerback, allowing him to make costly mistake after costly mistake at that position, then shifted him to the left side of a back three, then most recently played him as a left fullback. The team played Christian Ramirez, Abu Danladi, and Mason Toye as strikers, depending on who was the least banged up, then decided none of them were good enough, traded Ramirez, signed an older but less proven striker, and then when he got hurt, there was nobody left to play the position except Romario Ibarra, a converted winger who immediately bagged the best goals per minute rate of the bunch. This is the second straight year that the Loons have constantly shifted formations and styles, and still they have yet to get a single tactical approach consistently right. Throughout these two years, the team has gotten consistently older, with little evidence of improvement on either side of the ball. In 2017, the club repeated the mantra that the three Vadim Demidov games were an aberration, and should not be counted in any evaluation of the club’s performance. The Loons have now played thirty-one games in the 2018 season—as many as they played in 2017 without the infamous Norwegian. The 2017 and 2018 versions of the Loons are both equal in points (36). The 2018 version has scored three more goals (46 to 43), but allowed nine more goals (63 to 54). The Loons are on pace to concede 69 goals in 2018, just one shy of the record they achieved last season with those three Demidov turkeys. The disaster in Chester came days after club CEO Chris Wright doubled down on his tone deaf comments that the team’s technical staff deserved a passing grade for their nearly two years of work. Wright was on hand in Philadelphia to witness just how steep his grading curve has become. After watching the first half alone as seeming the only occupant of the team’s box, he retreated inside at halftime and wasn’t spotted again. Perhaps the team’s abysmal performance in the first forty-five has caused him to reconsider the vote of confidence he gave the on-field management. But losing badly is something that happens even to good teams. Even more egregious was the way in which the Loons were managed in the second half. Just a few weeks ago, I laid out the team’s all-but-impossible playoff math, and made the case that the team’s best strategy for the remaining games of the season was to get as much playing time in the hands of its young players as possible. But clearly the club doesn’t agree. The first frustration came when winger Alexi Gómez entered the match at halftime for the team. While Gómez is 25, which counts as young on this Minnesota team, he is also on loan, getting paid a lot of money, and is taking up an international spot. After half a season with 1250 minutes of playing time and more penalties conceded (1) than goals and assists combined (0), it’s hard to imagine the club renewing his loan or exercising a purchase option for next season. So why was he out on the field taking time that could’ve gone to Eric Miller, who is also 25, and is a domestic player actually contracted to the Loons? The next substitute, coming all the way in the 69th minute, was to introduce the coach’s son, Harrison Heath. I have nothing against Heath personally, who has played fine and avoided the type of error that turned fans in Atlanta against him. How he plays and how he conducts himself is not relevant to the essential fact that it is wildly inappropriate that he was signed to the team, and that every minute he gets on the field calls inevitably calls into question the motivations of his father, the coach. That Heath entered the field in place of Maximiano (23) and not Fernando Bob (30) was a further disappointment. The younger Brazilian was not having a great game, but neither was anyone else on the team. While he too is on loan, he has gotten a third of the minutes of Gómez, and needs further scrutiny. With only three games left, how many more looks will the Loons get before determining whether to invest in him as a future cornerstone defensive midfielder? The final sub of the night was the worst of all. Ibson has had a great career with Minnesota, and can certainly provide an X-factor in the midfield. He is also turning thirty-five in November. At a three goal deficit, on the road, with playoff elimination virtually assured, Ibson’s inclusion was unfathomable. Meanwhile, left on the bench were the team’s top two picks in January’s SuperDraft. Nineteen year-old Mason Toye was specifically pulled from his loan with Colorado Springs only to sit on the bench. Twenty-three year-old Wyatt Omsberg has not gone back to Tulsa in a while, but surely he could’ve been sent there instead of sitting on the bench and watching virtually every other defender on the team get shelled. Combined, Toye and Omsberg have played 191 fewer minutes than Tyrone Mears, the thirty-five year old journeyman fullback who hasn’t been with the team since late August. Combined, Toye, Omsberg, and Carter Manley, the top three picks from the Loons in the SuperDraft, have played fifty-six fewer minutes than Alexi Gómez alone, and Gómez joined the team over a month into the season (and to repeat, has not scored or assisted a single one of the twenty-two Loons goals scored while he was on the field as a winger or wingback). There has been something seriously short-sighted and problematic with the Loons’ distribution of minutes this year, and on Saturday, the problem was laid bare as starkly as the time when Mears was played out of position as a centerback while Omsberg sat on the bench, and the Loons lost badly regardless. If the Loons are going to lose badly they might at least get something for next year out of it. What is the plan? What is the plan to grow these young talents? What is the plan for how the team will play next season, and what tactical foundation is being laid right now to support that? I was asking these exact same questions last season, and it kills me that I’m asking them again. This club is a laughing stock around the league because nobody can figure out why the technical staff has been given a vote of confidence after a second straight embarrassing season. If the team’s technical staff has achieved a passing grade, let the team management explain exactly how they are being graded. The fans have never been given a full accounting of the club’s plan, and whatever that plan is has not become apparent on the field. If fans are to trust the direction of the club, it’s well past time that they be given a reason for that trust. What took place on the field on Saturday was not a “passing grade,” what has taken place on the field this season has not been a “passing grade.” Fans are owed a long-overdue acknowledgement of that from the club.